Employees of the Dallas Fed in the 1950s sorted cash. Dallas banker J. Howard Ardrey helped convince the Wilson administration to locate a new Federal Reserve Bank in Dallas. Postmaster General Albert S. Burleson was an influential Texan in the Wilson administration. The Dallas Chamber of Commerce, Dallas Clearing House Association and Dallas Cotton Exchange collaborated to produce this "Book of Facts" to help make the case for Dallas. The recipe for gingersnap icebox pudding that Dallas Fed employees have used for 60 years. One hundred years ago, Dallas was selected to be one of 12 locations to host a Federal Reserve Bank. It not only beat out other Texas cities, but also New Orleans, which at the time had a population three times larger. So how did "Little D" get a Reserve Bank? Texas bravado, in part. Together, the 12 banks form an agency that regulates the entire financial system and by extension the broader economy. That's why 100 years ago, businesspeople in cities across the country scrambled to make the case to be one of the chosen few. Dallas didn’t seem like an obvious choice. “It was actually the smallest city selected to be a Federal Reserve site,” says Princeton Williams, economic education program coordinator at the Dallas Fed. Three cities in Texas were vying for a reserve bank: Houston, Fort Worth and Dallas. It was a book and a train ride that helped Dallas stand out. It contained statistics on the city’s commercial prowess, such as factory output and new building permits. Williams explains that while Dallas might not have been the biggest, the city was growing at record-speed. Dallas had grown by more than 100 percent between 1900 and 1910, and by 41 percent in just the four years from 1904 to 1909. “Texas had always been an agricultural economy, and at the turn of the 20th century, it was becoming a commercial center and economic center that was going to take a leading role in the Southwest,” Williams said. The man behind the creation of the Book of Facts was George Dealey, publisher of The Dallas Morning News. Dealey organized a pro-Dallas rally in Washington and exploited the contacts he had in the capital. Perhaps his most influential intervention was something he arranged on a train ride. When Dealey learned that Postmaster General Albert Burleson – an influential figure in the Woodrow Wilson administration – would be traveling through Texas by train, he dispatched a reporter and bank executive, Howard Ardrey, to “accidentally” run into him. A reenactment of Dallas Banker J. Howard Ardrey and Dallas Morning News reporter Tom Finty meeting Postmaster General Albert Burleson on the train from St. Louis to Dallas. It was on this journey, from St. Louis to Dallas, that Ardrey made the sales pitch for Dallas. The Federal Reserve Bank of Dallas first opened its doors in November 1914. At the time, the U.S. was on a gold standard, and air conditioning had just been invented. When the few dozen employees moved into the Fed on South Akard Street in the 1920s, it was one of the first buildings west of the Mississippi to have air conditioning. 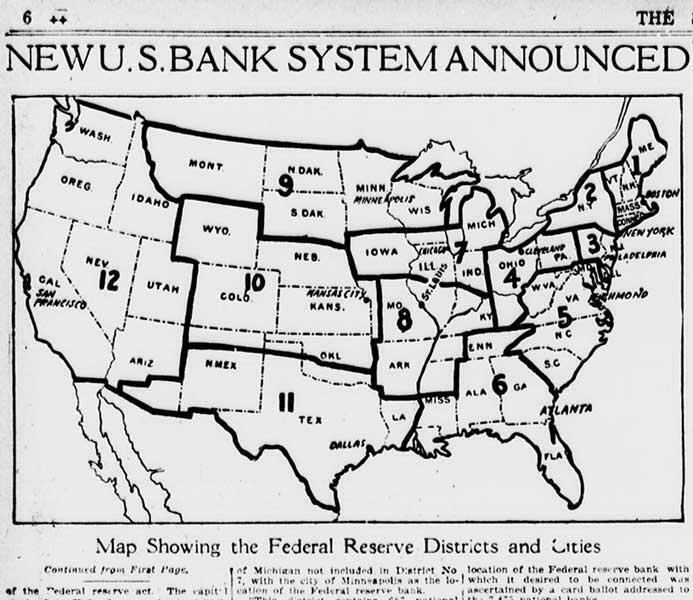 A new U.S. bank system is announced in The New York Sun in April 1914. Joan Perry, a Dallas Fed employee from 1958 to 1999, talks about what it was like to work at the bank in the late '50s. Today, more than 1,000 people work at the Dallas Fed, which is now in the Arts District. While much has changed in the past century, there’s one tradition that remains: gingersnap pudding. 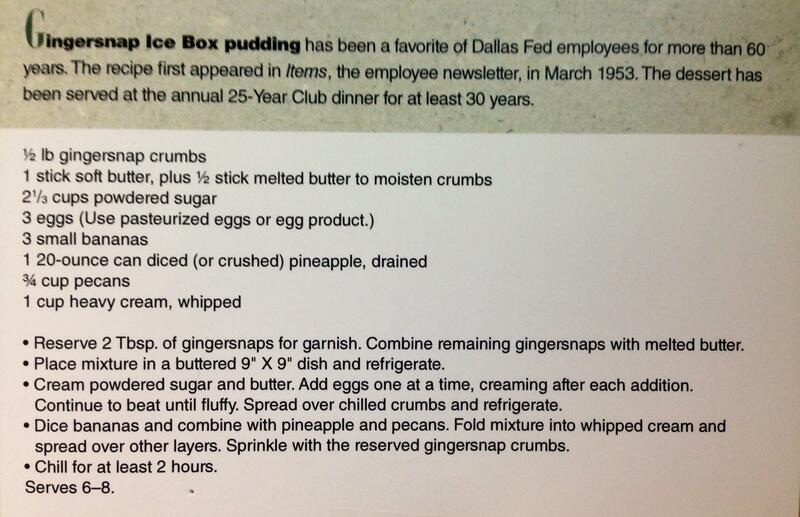 The recipe for Gingersnap Ice Box pudding that Dallas Fed employees have used for 60 years. Art Herrera, a Dallas Fed employee, talks about the first laptops the bank used in the late 1980s, one of which is in the exhibit. These were used by bank examiners when they went out in the field to examine banks. Dallas hosted a seminar on the Federal Reserve and monetary policy. Now, those words usually don’t exactly get the blood racing, but headliner and former Fed chief Ben Bernanke teamed with his host, George W. Bush, for an unusually candid – and even entertaining – series of chats. Roads are already being closed in preparation for Friday’s Dealey Plaza ceremony that marks the 50th anniversary of President Kennedy’s assassination. Both Dallas police and city officials remain tight-lipped about security plans. Expect a heavy police presence before, during and after Friday’s ceremony. Ex-President George W. Bush: Immigration Reform 'Done Right' Is Vital To The U.S.